Truth be told, it's a very comfortable album for fans and musicians alike. Hot on the heels of last year's eponymous Phantom 5 debut comes 'Play To Win' with Michael Voss (guitars, bass and vocals) and Claus Lessmann (lead vocals) sensing they're on to a good thing and attempting to push things further. It's always nice to hear a musician of the quality and stature of Voss throwing himself into a project, and I say that as one of those disappointed that he's not had more of a role with Michael Schenker in recent times. There's plenty here to put that disappointment to bed, with well-framed and occasionally stunning Schenker-esque lead breaks – presumably courtesy of Robert Boebel – throughout. Drums and "explosions" are again provided by Axel Kruse. It must be said that this is an extremely proficient and professional record. As you might expect, it's well produced, with a sound that's as rich and slick as anything you'll hear in the genre. The band are seasoned pros who sound like they can bang these type of tracks out in their sleep. So, what of the tracks? Opener 'The Change In You' brings instant class and energy, whereas 'Crossfire' provides warm keyboards and a familiar AOR groove. 'Baptised' has a slightly edgy riff and vocal delivery amid the AOR essentials, alternatively 'Read Your Mind' has a sprightly keyboard intro that, in the context of the album, is refreshing – the sorbet to the title track's more substantial chocolate fudge cake. 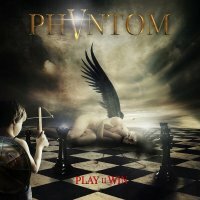 If it's riffs you love check out 'Phantom Child' and 'Had Enuff', while elsewhere 'Child Soldiers' adds a little gravitas (once you put the 'Crazy Train' riff echoes to the back of your mind). "Impeccable German Melodic Hard Rock" says the press release. Fair enough, but how good is it? I suspect fans of the genre, and particularly Bonfire and Mad Max fans, will love it. However, truth be told, it's a very comfortable album for fans and musicians alike. Despite the best efforts of 'Do You Believe In Love' and the piano-led ballad 'Reach Out', I'm not expecting any big chart hits or breakthrough to a mainstream audience any time soon. It's probably about twenty-five years too late for that.